One of the most potent and nutrient dense foods on earth, spirulina is perhaps best consumed in a smoothie. When I first came across spirulina and began researching why it was considered a superfood, what stood out was the fact that it’s 65-70% pure protein by dry weight. Because of that I usually refer to it as the green protein queen or green gold. Protein content aside, what’s so special about spirulina and why should you add it into your smoothies? Spirulina is rich in vitamins, minerals, antioxidants, and carotenoids. It’s a good source of vitamins A (beta-carotene), B1, B2, B6, E, and K and zinc, copper, iron, manganese, selenium, and the anti-inflammatory essential fatty acid gamma-linolenic acid (GLA). It’s also an abundant natural source of chlorophyll. As impressive as the nutrients and health benefits of spirulina are, it’s the protein content that keeps me buying and adding to my smoothies. A plant based protein that’s easy for the body to assimilate and absorb, mind you. 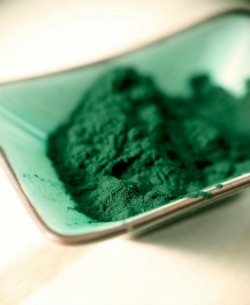 For more information on spirulina, click here to read my comprehensive article. For those who need protein first thing in the morning or after a workout, the green protein queen is for you. Most people don’t find the taste of spirulina very pleasing to the palate, therefore “hiding” it in a smoothie is the way to go. It pairs well with cacao, which this smoothie also calls for. As with any food or supplement you’re new to, start off with a small amount and work your way up. Like the picture of spirulina above, this smoothie will be dark green, and be forewarned you may have green lips after drinking. Enjoy! I’d love to know if you tried and enjoyed this spirulina superfood smoothie – please do tell in the comments below. Happy Blending! This smoothie is delicious! I try to get my husband to have a healthy smoothie daily and I fail everytime. Finally, I have found one that he is willing to have. He loved it and was surprised to see how many benefits this smoothie has. Thank you so much for sharing. This recipe yields about 350 ml, Amal.